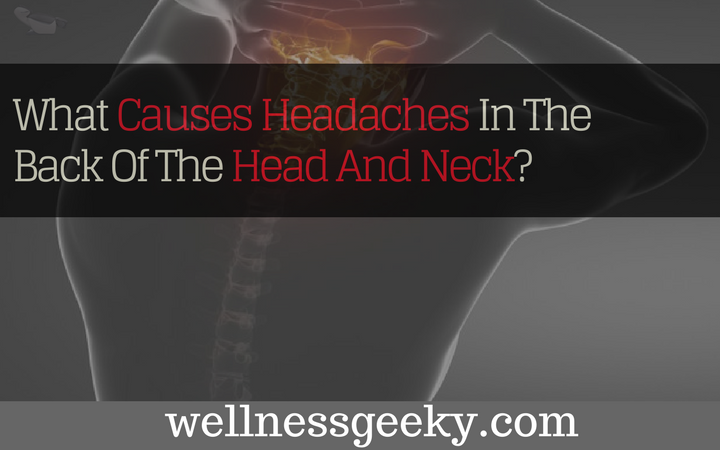 What Causes Headaches In The Back Of The Head And Neck? You are here: Home / Massage / What Causes Headaches In The Back Of The Head And Neck? Headaches can range from annoying to severe and they can occur in any part of the head. However, one of the most common types of headaches people experience frequently are headaches in the back of the head and neck. So, What Cuses Headaches in the Neck and the Back of the Head? There are various causes that can lead to neck & back pain (headaches in the back of the neck and head). In a nutshell, arthritis headaches are caused by the swelling and inflammation in the neck area. The swelling and inflammation often cause pain in the back of the head and neck. The headache also limits the range of neck and head movement as any sudden movement can result in extreme pain. These headaches are commonly caused by osteoarthritis and rheumatoid arthritis. If you experience pain in the back of the head and neck regularly, it could be due to your bad posture. When you have poor body posture, the positioning can play an atrocious role in creating tension in your shoulders, back, and neck. The tension then causes a dull, throbbing pain at the base of your skull. It is also possible for you to experience neck pain and tension because of the herniated disks in the cervical spine. The headache caused by herniate disks is referred to as cervicogneic headache. Additionally, you may also experience discomfort in the upper arms or the shoulders. When experiencing such a headache, you shouldn´t lie down on your bed as doing so intensifies the headache. Occipital Neuralgia is basically a condition that is caused by the damage of the nerves that run from the spinal cord to the scalp. People who suffer from this condition experience aching, sharp, throbbing pain at the base of the head in the neck. Other symptoms of this condition include tender scalp, stiff neck, sensitivity to light, and pain behind the eyes. The pain felt in the right side and back of the head is known as tension headaches. They may include a tightness of the scalp or the neck. If we are to describe the pain caused by tension headaches, they feel like a tight constricting pain that is dull and isn´t throbbing. These headaches are usually caused by the muscle contractions in the head and neck regions. Many people even develop tension headaches by either driving for a lengthy period or by staring at a computer screen for a long time. Tension headaches are normally felt on the right side and back of the head. So, what about the left side of the head? Is not susceptible to pain and headaches? Well, the pain you normally experience in the left side and back of the head is commonly identified as migraines. Some of the symptoms of migraines include nausea, vomiting, watery eyes, light or sound sensitivity, and severe, throbbing, pulsating pain. Migraines generally start on the left side of the head, slowly moving around the temple to the back of the head. It is also possible for you to experience pain in the back of the head when you lie down. Such headaches are called cluster headaches. Although they are quite rare, when they do occur, they unleash extreme, severe pain. The pain can either be felt on the sides or the back of the head. And, as we stated earlier, it gets worse when lying down. Some of the symptoms of cluster headaches are nausea, stuffy nose, drooping eyelid, restlessness, and sharp, penetrating, burning pain. Now that we have covered the various different causes of headaches in the back of the head and neck, it is also essential to know what you can do to prevent and treat the headaches. So, how can the headaches be treated? Treat Arthritis headaches: Arthritis headaches can be cured with anti-inflammatories and heat to reduce inflammation. Treat migraines: There are a variety of ways you can treat migraines. If you are not keen on taking over-the-counter medications, you should know that there are natural solutions as well. For instance, you can eat nuts for relief from migraines. Nuts contain a pain-blocking agent known as, salicin, which is highly present in medications. Or, you can simply ask your partner to give you a calm and pain-relieving massage. Doing so stimulates the blood flow and sends the pain away. Treat headaches caused by poor posture: If you diagnose your headache and realize that it is caused by a poor posture, you should attempt to correct your posture immediately i.e. if you are looking for a long-term solution. And, you can help yourself by investing in an ergonomic work chair with good lumbar support. For immediate relief, you should try the medication, acetaminophen. Treat headaches caused by herniated disks: For headaches caused by severe conditions like herniated disks, you should attempt to seek professional, medical help. Some of the treatment for the condition can include stretching, epidural injections for inflammation, physical therapy, and chiropractic manipulation. There may even be a need for you to undergo surgery. Exercises can also help relieve the pain. Treat tension headaches: If you are looking to treat tension headaches at home, you should attempt to first relax in a stress-free environment. As its name suggests, tension headaches are often caused because of stress. In a quiet dark room, you can perform deep breathing exercises and apply a hot or cold compress to your head. You can also ease the pain and discomfort by applying peppermint oil to your temples, forehead, and the back of your jaw. And, most importantly, you should not forget to hydrate yourself. After all, dehydration can trigger headaches.